Spa Village Resort Tembok, set against a landscape of soaring peaks, black volcanic sand and the Bali sea, infuses the gentle spirituality of Bali and its rich culture in every encounter. Its philosophy of wellness extends beyond the daily spa treatments and encompasses every aspect from activities and lifestyle to architecture and cuisine. Learn the delicate art of lontar weaving from local artisans, watch the sunrise from the peak of the island's sacred mountain or simply relax and revive with a traditional spa treatment under the hands of a skilful therapist. Step back into time and discover the rich heritage of Bali at Spa Village Resort Tembok, Bali. Situated on Bali's North East coast, this charming spa resort draws from age-old Balinese traditions that are wrapped in spirituality and gentleness, making this beautiful and secluded resort the perfect place for relaxation, recovery and self-discovery. Honouring the Healing Traditions of Bali - with the promise of an experience that honours the healing cultures of the region. Each Spa Village provides an individual and authentic encounter, combining the therapeutic properties of natural local ingredients and the healing practices of the area. 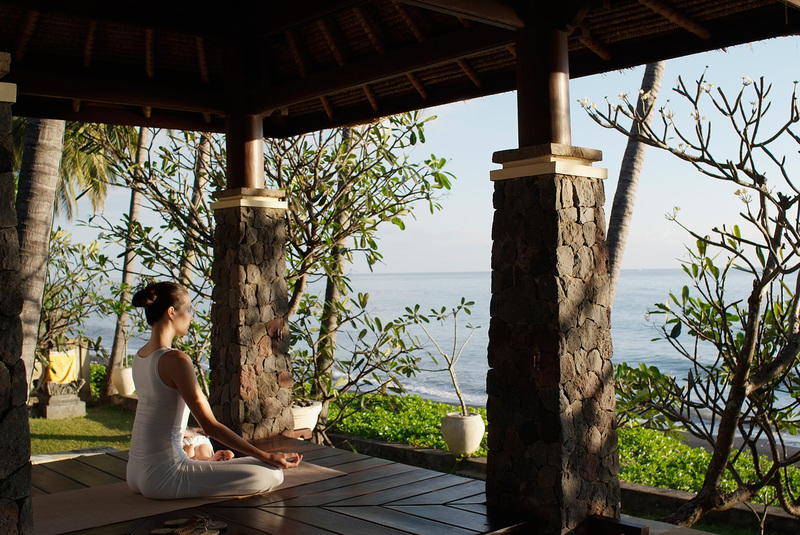 Here, at Spa Village Resort Tembok, Bali the experience extends far beyond its spa treatments. Every aspect from architecture to cuisine and lifestyle, resonates within its Discovery Paths. Cradling the soul, this spa resort rejuvenates both body and psyche. Located on a black beach North East Bali, approximately three hours from Ngurah Rai (Denpasar)International Airport. Effortlessly blending with the island's natural beauty, the structures of this Spa Village merge simple Western elegance with traditional Balinese dwellings. Design is kept sophisticated yet understated with natural Balinese timber accented by neutral fabrics and simple local decorative elements. Rooms are transformed into exclusive havens, suites are generous with stunning views, whilst the villas are private sanctuaries of peace. Contemplate life on the wide terraces or balconies, take a rejuvenating plunge into the pool or explore and discover Bali at your personal pace. 27 Kamar Rooms: simple elegance is the foundation with each room featuring the gentle traditions of Balinese culture and the blend of modern comfort. A private haven with the bedroom connecting to a spacious marble bathroom and a sliding door from the room leading onto a wide terrace or balcony that offers an expansive view. 2 Suites: These spacious rooms occupy the upper level of the Spa Village Resort. The Surya Suite is located close to the luminescent pool, while the Purnama Suite fronts the evergreen garden. Both one-bedroom suites have a generous living area with stunning balcony views of bougainvillea and frangipani infused garden to the blue waters of the Bali sea. 2 Villas: Basking beneath the shade of palm trees, the Spa Village Resort the one-bedroom villas are sanctuaries of peace, each with their own private entry and plunge pool with unobstructed views of the ocean. The beds in the villas are talentedly crafted by local artists. The rooms are light and airy with woven ceilings covering the underside of peaked roofs creating an environment of comfortable luxury, imbued with the serenity that is offered at the Spa Village Resort. Internet available in the lobby area. Extensions of check out time are subject to availability and will be charged as follows: check out until 1800 is 50% of room rate and after 1800 is nightly rate. All subject to availability. The unique setting of the Spa Village Resort's restaurant provides beautiful views of the ocean. Traditional artwork combined with rattan furniture and teakwood tables to provide an airy and comfortable environment and a casual dress code. Breakfast, lunch and dinner are served daily as an a la carte menu with the selections such as Indonesian fusion with light Western cuisine. The restaurants special menu changes daily and is a highpoint of the dining experience. Pre-dinner drinks are available at Taman Gili. The Spa Village Pre-treatment ritual is an integral part of the entire spa experience. The Segara Giri preludes every treatment, its the cleansing of the feet with black sand. Segara means Ocean and Giri means Mountain in the Balinese language - Spa Village Resort Tembok rests between the mountain and the ocean. The black volcanic sand of the beach is created from the interaction between these two powerful forces of nature. The Balinese belief, is that the feet act as a conduit between the energy of the earth and the self, therefore washing the feet is considered a way of purifying the self of any negativity that may arise from the earth. All other products are made from fresh herbs, fruits and spices. All food is locally sourced wherever possible, is fresh and portion sized. Offers an extensive juice menu. TV Room: available 24 hours a day. 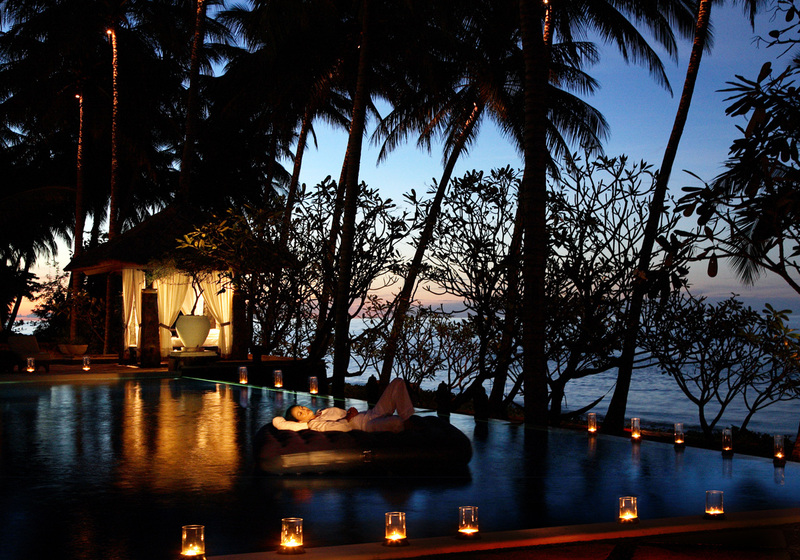 The Boutique: offers unique and stylish Balinese crafts and a range of spa products. Swimming Pool: lying adjacent to the beach, surrounded by majestic palm tress is the large midnight blue infinity pool. Cool waters blend seamlessly with views of the ocean and the Balinese sky. Surrounded at four points by thatched "Bale" pavilions, where guests can relax in the cool shade, daze or watch the passing sampans as the sail by. Lumba-Lumba - the recreation and exercise room: dedicated to health and recreation this expansive room opens to the sea providing a range of fitness machines for the energetic and is the perfect location for indoor yoga and exercise classes.